Life at 7000 feet: Short and Sweet! The weekend was short, but sweet, and that's my goal for this post as well! 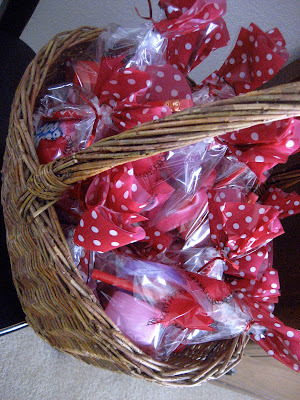 The girls and I spent part of Saturday working on our Valentine's stuff. Abbey is bringing the treat bags for her class party on Thursday, so we set up an assembly line and knocked these out in no time! Can't for the life of me figure out how to save the rotated image in iPhoto and wasted time I don't really have to waste while trying. Then we made our stripey pretzels for the girls' teachers. Sarah has seven teachers and Abbey wants to make treats for half of the school staff so I took the easy way out this time. We made 15 pretzel bags for $8--which made me happy! (I had the bags and the ribbon already. That price was for pretzels and red/white melting chips). 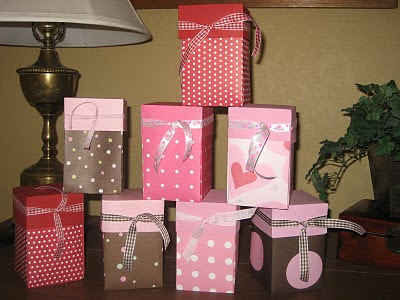 We made these cute paper boxes a few years ago and while they are super cute and inexpensive, they are slightly more involved. I didn't have time to knock 15 of 'em out this year. But if YOU want to knock yourself out, here's a link with directions. We also watched the Super Bowl. While eating delicious, fattening food. I'm working on brevity (not my strong suit) so will close with the reminder that 10 on the 10th is this week. I'll try to have my post up tomorrow night for those of you who feel inspired to link up. 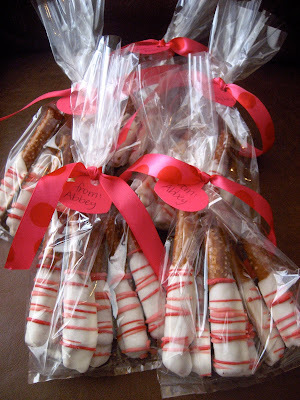 Lurve the pretzel idea for Valentines day, Mer. You always do things with such thoughtfulness and panache, and it's nice to be able to do something which is a beautiful gesture, but doesn't break the bank. I remember those boxes. I ended up making a few myself! Sounds like your weekend was perfect parts work and pleasure! Wow! Such creativness. I'll be happy if we actually decorate the sugar cookies this time. I'm doing the pretzels for teacher treats this year - I got the red melting chips on the after christmas sale at Michael's. Thanks for reminding me that I did that! I can't wait until the kids can help with fun teachers gifts...although they are boys- might not happen!! Do love the pretzels...I am stealing the idea- for a bake sale at church this weekend...I have all those ingredients!! Yay for your idea- Thanks!! Those Valentine's gifts are so incredibly cute and thoughtful!!! Can you pass some of your crafty on to me, please? Oh! I'd forgotten about those pretzels!!! I need to make some of those next time we have to bring snack! !